"With some dogs you share a boil in the bag breakfast and maybe a blanket on a cold desert floor. Some you wouldn't leave in charge of your Grandma unless you wanted to find out just how fast the old girl could run. But, if you're very, very lucky there will be the one dog you would lay down your life for – and for me that dog is Buster." 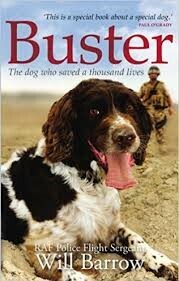 Buster, an English springer spaniel who has served his comrades and his country with unstinting devotion, has saved thousands of lives. This is the story of his partnership with RAF Police Sergeant Will Barrow, told by Will himself, describing how each came to save the other's life. It is a relationship that produced some heroic feats―including sniffing out explosive vests that led to the arrests of two suicide bombers―in the dust and desert heat of Afghanistan and beyond. Buster, uniquely, has served five tours of duty in three theatres of war (Bosnia, Iraq, and Afghanistan)―more than any other military dog. He also won the prestigious Crufts Friends for Life Award in 2012, and has gone on to become the official lifetime mascot of the RAF Police, the only dog in history to have been honored in that manner. A best friend in dog's clothing, an RAF dog with his mossy feet firmly on the ground, Buster is truly a dog in a million.